The Residential Rental Market is ON FIRE! 1. Landlords can be selective with a larger number of tenant leads. 2. Landlords avoid rental vacancies when they list when demand is high. 3. Landlords can charge a higher rent price, because demand is higher. 4. Landlords increase the chances of finding quality tenants who pay rent on time and take care of the property. Tagged Apex Leasing Agency, bev roberts rentals, Bev Roberts Rentals and Property Management, Landlord Tips, Leasing Agency in Raleigh North Carolina, Located in Cary North Carolina, Property Management, Realtor in Cary North Carolina, Rental Agent in Apex, Residential Rental Real Estate, Serving the Triangle Area, Serving the Wake County Area, The Residential Rental Market is ON FIRE! I wish I would have contacted Bev Roberts Rentals! Even though they’re becoming more optimistic about their financial situations, more people who rent their homes are foregoing buying a house. One in five renters now say they have no interest in ever owning a home, up from 13% in January 2016, according to a report released this week by Freddie Mac. And nearly 60% of current renters expect to rent their next property when they make their next move, up from 55% in September. This shift toward renting versus buying is occurring despite a relative improvement in the financial situations for many renters: 41% of them say they have enough funds to go beyond each payday, as opposed to living paycheck to paycheck or not having enough money for basic necessities, the highest level since October 2015, Freddie Mac found. Harris Poll surveyed more than 4,000 adults on Freddie Mac’s behalf, of which 1,282 were renters, to help produce the report. And yet a sizable chunk of people are unhappy with renting. Nearly 40% of people Freddie Mac surveyed were dissatisfied to some extent with their rental experience, with young and urban renters — who are likely to be living in smaller, more expensive spaces — more likely to be displeased. So why are they not buying? 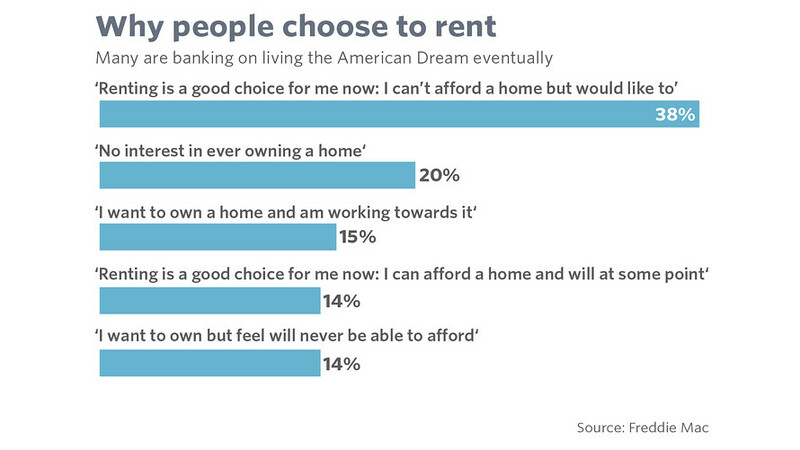 People’s attitudes toward affordability, which cut across generations, is a big factor. “Although their finances are better, renters are comfortable with continuing to rent with many believing renting will be more affordable or stay the same for them in the next 12 months,” Freddie Mac noted. In particular, rising home values have hurt many would-be homebuyers. A recent report from real-estate website Zillow found that more than two-thirds of renters cite the down payment as the biggest obstacle to owning a home. Indeed, it can take more than a typical year’s salary in some markets to be able to afford one. Happy Friday; unless, of course, you’re in Real Estate. Happy Friday everyone; unless, of course, you’re in Real Estate. Have You Had Your Rental Home On The Market Long? As a #TriangleArea property manager, our main priority is maximizing your annual rental income. This means minimizing your rental vacancy rates. Have you had your house on the market long?! We can help! Give us a call at (919) 306-5665.